This was created by Keith Edwards, Sharon Parsons, Olga Mosina, and Tomislav Ivanovic. In this portion of the report we identify a number of steps that should be taken in order to ensure that the Winelover is prepared to take full advantage of the visit an that we are in a position to maximize the value that the winery will realize as a result of hosting us. The blocks of data that need to be collected in order to gain a full appreciation for what the winemaker is doing at the estate are as follows: winemaking philosophy, the viticultural environment, and the vinicultural environment. These blocks of data are best collected in the order listed. The Winelover does not have to ask every question in order to guide this flow but should be prepared to intervene to put the conversation back onto this path if it begins to stray. In addition, the winelover needs to get a perspective on the estate’s overarching philosophy and that data collection will be threaded throughout the entire effort. A winery hosting a group of winelovers is looking to increase media coverage and social media buzz as well as to acquire new ‘brand ambassadors,’ all of which will ultimately help to increase its brand recognition and sales. The Winelover community has done a good job facilitating the above and now wants to increase the quantity and quality of the content its members produce and the audience for this content. make it easier to track content. Research completed prior to the trip will help participants to stay more focused, ask specific questions, and collect better data duringthe trip. At the same time, no topics, creative styles, or research methods are being forced upon participants. Creation of pre-trip content will make participants more likely to create post-trip content (eithera follow-up on their earlier thoughts or something completely different). If it becomes clear from pre-trip content that there are some specific interests in the groups, the trip can perhaps be tweaked to adapt to these interests. For example, if several people are interested in local food that goes with wine, or local wine tourism, or a specific style of wineries, some parallel visits can be arranged to accommodate these interests. Organizers of Winelover trips may choose to consider pre- and post-trip content as an essential part of the application process for future trips. This creates a simple rule for applicants: in order to be considered as a participant on the trip, one needs to submit content from (a) previous trip(s). The objective of any site visit should be to come away with as clear an understanding as possible as to: (i) the wines that are being produced at the establishment; (ii) the quality of the wines produced therein; and (iii) why the specific quality levels. In order to arrive at this level of understanding, it is my opinion that data need to be collected in a systematic manner so that the various elements can be placed in proper sequence and weighed both against each other and the data collector’s experiences. I will expound on these thoughts in the following sections but first some preliminary material. It is possible that the visit will include both vineyard and winery tours in addition to tastings. The Winelover should dress accordingly, with special care taken to wear comfortable shoes. 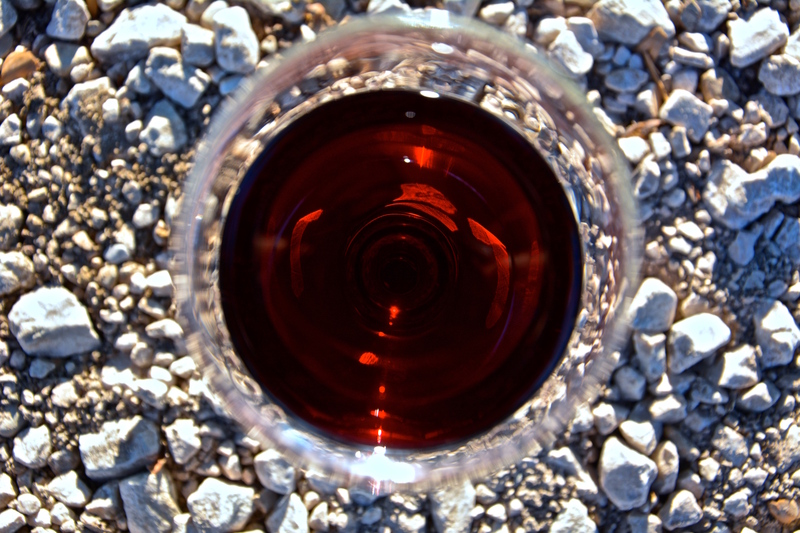 The Winelover should refrain from consuming products beforehand that could compromise his/her ability to properly taste and evaluate the wine. The Winelover should ensure that he/she is on time for the appointment. The Winelover should courteously, but confidently, introduce him/herself to the person conducting the tour and should have a business card to present to said person. It is appropriate to ask for a reciprocal business card at that time. Listen carefully to any instructions given and adhere to them during the course of the visit. You do not want to be the “smartass” in the group. A negative perception of an individual or the group by the tour leader could crimp the flow of relevant information. If you are planning on using voice or video recorders please inform the tour guide and ensure that he/she is ok with that. The blocks of data that need to be collected in order to gain a full appreciation for what the winemaker is doing at the estate are shown in the figure below. These blocks of data are best collected in the order listed. The Winelover does not have to ask every question in order to guide this flow but should be prepared to intervene to put the conversation back onto this path if it begins to stray. In addition, the winelover needs to get a perspective on the estate’s overarching philosophy and that data collection will be threaded throughout the entire effort. Some of this data may have been collected and curated prior to the visit (as described in Winelover Preparation for the Winery Visit) and should be validated during the interaction with winery staff. This area examines the principles which guide the winemaker’s actions. There is no right answer here but the answer provides a sense of the school of winemaking that he/she pursues and why. It gives a sense of what the terroir provides and how the winemaker seeks to exploit that. This will generally be a free-form discussion and the Winelover should attempt to capture as much of this dialogue as he/she can. Quality grapes are a precursor of quality wine and the science of viticulture has developed and evolved with a single goal in mind: the delivery of high-quality wine grapes to the winery. 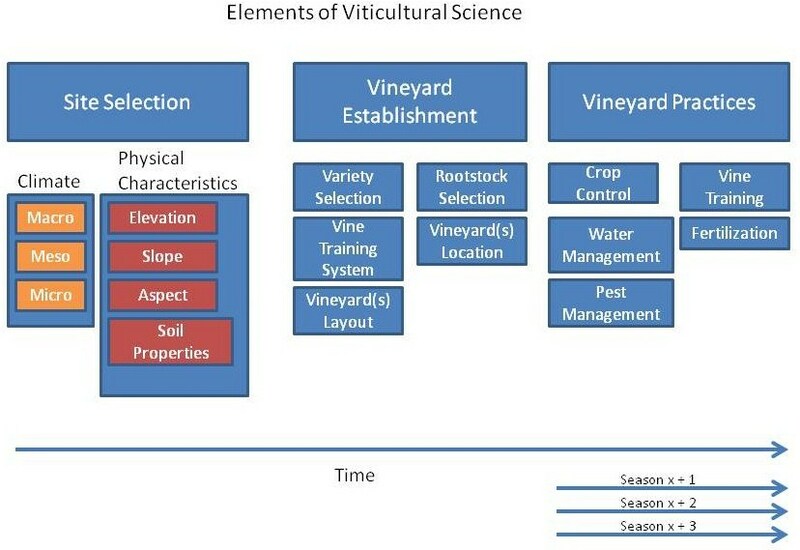 The quality of wine grapes produced in a specific harvest is not only a function of that year’s harvest conditions; rather, it is the result of a combination of factors which, together, represent the full scope of viticultural science. The data elements that need to be collected in this space are shown in the figure below. 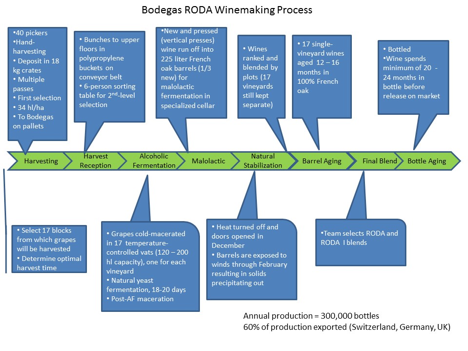 The figure below is a graphical depiction of the wine production process with some extensions that are specific to the Clark Smith Post-modernwinemaking schema. As stated in his book, postmodern winemaking does not seek to throw out all elements of modernity and replace them lock, stock, and barrel with a new canon. Rather, postmodern winemaking uses existing pieces where appropriate and substitutes as necessary. 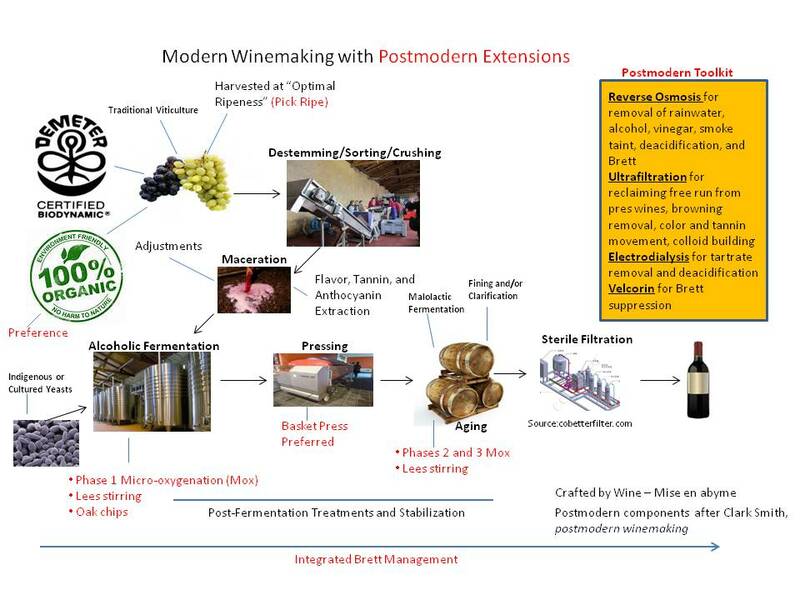 The key extensions of postmodern winemaking are shown in the box in the top-right labeled Postmodern Toolkit. If a Winelover encounters a winemaker who practices postmodern winemaking, these extensions should be explored. The subject of granularity of data collection needs to be considered by the Winelover. The leftmost column in the figure below shows the highest level of data that will be captured. Data at this level can be collected during a dialogue with the winery team. As you move to the right in the table, the data becomes more granular and will require some effort on the part of the winery to come up with answers. If data of this granularity is required, they should be collected via pre- or post-visit questionnaires. After the tour of the vineyard and production facilities, the practice is for the winemaker to take the group into the tasting room to sample some of the output (Some of this tasting may have occurred in the cellar as a tasting of barrel samples). 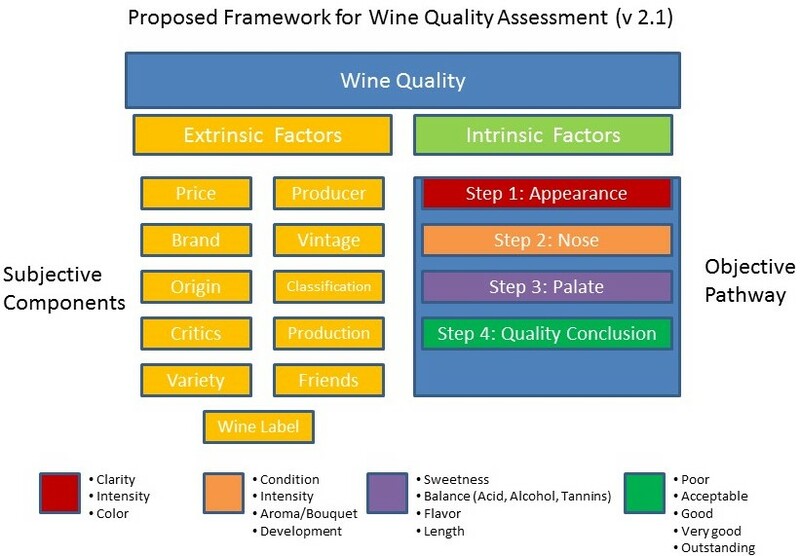 I have developed a mechanism for assessing a wine which takes into account a number of intrinsic and extrinsic factors of quality. For our purposes, the intrinsic factors (what is in the glass) would be an appropriate data set. 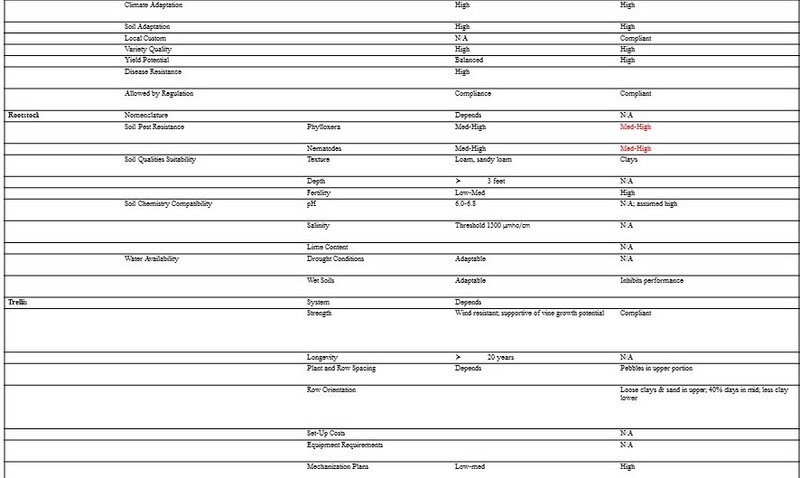 The model is shown below with the intrinsic factors in the right column. 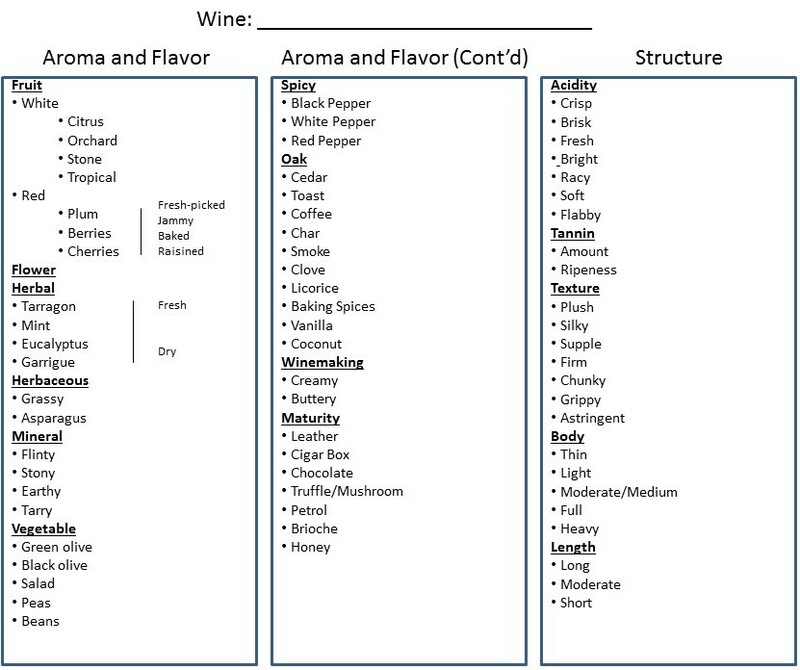 A crib sheet of wine descriptors is provided below. Lettie Teague, writing in the Wall Street Journal (http://www.wsj.com/articles/a-winery-tasting-room-guide-to-sipping-and-spitting-1401469556) stipulates that “… all wine professionals spit out their wine religiously – and everyone who is tasting wine should … “ and we recommend that #Winelovers adhere to this principle when visiting our winery partners. Depending on the breadth of the winery portfolio, a not-insubstantial amount of alcohol may be provided to the Winelover at the tasting. Swallowing that much wine may result in inebriation which could lead to shoddy assessment of the wines presented or (horror of horrors) visible signs of intoxication. At the conclusion of the visit, the winery team should be thanked for their hospitality and the member responsible for dealing with follow-up questions identified. Missing good quality photos/visuals to help tell the story (if a written report). Potential Solutions: Press Kit photos, contacting winery or regional wine association for photos, etc. Photos taken by participants on #Winelover trips shared on Instragram and Pinterest are another source. Always give credit to the source(s). Also, do not forget to © your own photos etc. that you include in your posts. New interest/questions often arise during the write-up, which the winery visit did not address. Commonly most winery visits focus on tasting their wines, a quick look in the cellar and sometimes a peek at the vineyards. Potential Solutions: If you know in advance you want to do something specific then request this information in advance and/or plan an online follow-up. Again contacting winery or regional wine associations can often provide the specific information you want. Specific details are often hard to get during a large group visit, such as the winery story, viticulture, viniculture, in-depth tasting details, and specific information on wines (such as, a non-marketing perspective – readers often like knowing if there is something different, special, or unique about the wines), the people that make it happen – proprietor(s), winemaker, etc., wine region (US -AVA, Europe – AOC/DOCG, DOC etc..). Potential Solutions: Research online and/or contact potential source(s) of information. Other overall mechanisms for getting missing data: Online research often answers many of your questions, or will provide missing data. Most important however is to not forget that the winery PR person or the regional winery association is often the best sources. Contacts at the winery and/or local representatives are worth their weight in gold when you get back home. Also, do not forget to pose your questions within the #Winelover community or to other wine groups. Often group members can point you in the right direction to a source where you will find the missing information. In the case of #Winelovers trips, it seems that communication with the host is key in order to get the kind of information needed in advance. If we were all more prepared before arriving there would be better questions. Since most wineries have some kind of PR, getting information in advance would be helpful in being prepared. It is important to use a consistent form and style (choose one form and style format and stick with it). Remember whether you write online or for a print publisher the use of headings and subheadings are important. Readers quickly judge anything on the Internet by scanning down the left margins for key words they like and to judge the length. So the words at the edge of the page are the most important to keep them reading. Also always use photos, charts, graphs etc. to enhance your writing. Choose a primary focus for each article/post you write. Typical online publications like articles around 400-600 words. To turn up in a Google search an article needs at least 400 words. Sure it can be longer but when it goes beyond 1000-1200 words consider breaking the article into two or more with different foci. Remember that the average attention span for the written word is around 300 words so visuals really help. Leading with a visual always gets more clicks. The content of your article should always be in good taste. If you cannot write something positive about a specific winery or site visited then consider not writing about it. Consider taking another focus for your article. Yes, you can be a critic. If you plan on being a critic be professional and make sure you use an analytical approach versus an attack. Do not write about an area in which you have limited or no expertise. Again do not forget to copyright your work. It can helpful in some cases when your work might be stolen by someone who copies and pastes at their website. With micro-blogging (Twitter, Instagram, etc.) posting is often immediate while writing a blog post takes longer. When sharing a blog post, the greatest impact within the group is often within one to two weeks. Nevertheless, reporting later is not a problem for other audiences. Besides you might consider who is your target audience (fellow bloggers, wineries, winery visitors, travelers, etc.). Wineries always like reading articles written about them. Aim for posting your first article within a month; however, they will read later posts. In the case of wineries, they often like to share with their customers and other members of the wine community. Winery visitors and travelers will often discover your writings through searches. Although it is considered faddish by some, certain articles are best if they are published just before a season or holiday. Even after you post your article you may later develop insights that allow you to write further articles. For example, sometimes a wine (Chardonnay Day, Champagne for Valentine’s Day, etc.) or a region (a wine region being named the wine region of the year, top five wine regions) becomes a hot topic and you find you have almost the perfect article, with a little tweaking, that is ready to go. This is perfect timing so take advantage of it. Note: The above applies mainly to general blogging, however it is important to note that micro-blogging can be very effective. Hopefully, micro-bloggers within the #Winelover community will add some of their best insights for Twitter, Instagram, and Pinterest. There will always be new platforms. Could a general set of guidelines work across all platforms? After all the data have been collected, it is time to add value by drawing it all into a cohesive whole. In terms of formatting, it is suggested that the report follows along the lines of the data collection effort. 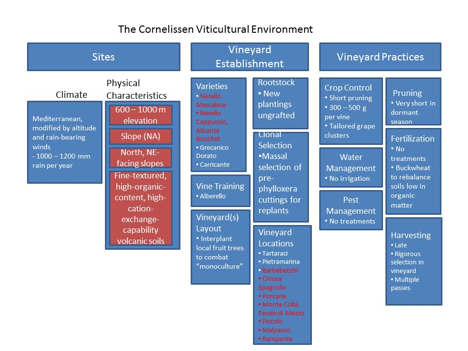 And for those cases, the following two figures provide overarching frameworks for reporting on the viticulture and viniculture environments. Of course, if the report is not a straight-up reporting on the facts of the visit, but is, instead, some unique perspective, then the Winelover has to determine the best organization schema for that report. In addition, wineries that offered you their hospitality and dedicated time and resources to introduce you to their story and wines, will greatly appreciate your reporting as a marketing tool and promotional material. –who is your target audience (pay attention to age, gender, cultural background, amateurs vs. professionals, etc because these features affect the choice and style of your report to a great extent). Once you know your target audience, you will be able to communicate effectively with them. This will help you determine your writing style and reporting format. Here we will go through most frequent reporting mechanisms and give you an inventory of available reporting formats so that you can pick the most convenient ones when you need it. WRITTEN REPORT – the most frequent type of report. Most articles found on common wine blogs would fit into this category. Depending on your target audience, you may combine fiction and factual writing, or descriptive passages and strictly technical ones… Also, this reporting mechanism may be formal, semi-formal or informal, depending on your target audience. This type of reporting offers the writer great freedom in terms of style and personal approach. Personal views and historical facts and information can be successfully blended in order to create a successful story. A good written report is generally what you want to read yourself. Don’t attempt to WRITE a report. Instead, sit down, pour a glass of wine and create something you’d want to read. Be careful when talking about yourself. Avoid turning your report into self-centered bragging. Most readers will recognize such boastful attempts. Your opinions are interesting to other people if you can make them amusing, justify them or explain them. Long paragraphs are hard to read and they’re boring, too. Internet-based readers often scan and skim the text, so they want something short and fast to read. Big, chunky paragraphs get skipped over. The ideal length of a paragraph for fast reading is about five to seven sentences. In a case of real need to write a lengthy article with numerous paragraphs, you are strongly advised to divide long chunks of text with other content (eg. photographs, videos, etc). Monotonous visual formatting of the report is almost guaranteed to put people to sleep. Don’t hesitate to use headers and sub-headers so that readers can easily spot information they are looking for. Insert some bullet-point or numbered lists. Try bolding parts of phrasing. On the other hand, don’t overdo it either. Too many headers, bolded words, and bullet-points in the article aren’t attractive. Paint a picture, and be specific. Wine-loving crowd is fond of wine stories that tell a story. Specific anecdotes that illustrate your point, parts of the conversation with the winemaker, interesting history of a particular label or a vineyard are a great way to bring your story to life and demonstrate your points. So, instead of talking about how complex the winemaking process is, show us how complex the winemaking process is. PODCAST – Podcasts aren’t the most popular and hottest digital marketing technique, however they can be used quite effectively to build an audience and increase awareness by reaching iTunes charts. Good thing about podcasts is that generally you require little or no budget to get you started. Sound quality matters. Be careful if you decide to record materials for your podcast during the visit. Outdoors, there may be unplanned noise which will seriously affect the quality of your recording. Keep in mind that if there are sound problems, most listeners will change podcast rather than keep struggling to hear the remaining part. Stay focused. An average episode length is 20 minutes. You may stretch it to about 30 minutes, but keep in mind that your audience will gradually lose interest and revert to something else. Podcast audience is usually doing something else while listening to your episodes eg. jogging, commuting to work, gardening, house chores, etc. Conversational means entertaining. Owing to its nature, a podcast episode is most effective when it communicates directly with audience. Therefore, you will not make a mistake if your style is conversational, easy-listening, resembling “the real life”. Don’t be afraid to invite another speaker for a lively chat… Dialogue sounds more fun than a monologue. You can interview winery staff, winemaker or another colleague who visited the winery with you during the press trip. Diversity. Podcast offers great opportunity to exploit the winery visit to a maximum. Beside an episode about the winery and the cellar tour, you can also create additional episodes featuring the interview with wine staff or winery owner and other news or actual information. It will result in an entire series of related stories. – VIDEO REPORT/VLOG – The first thing that comes to your mind when you hear the term vlog/video report is probably a post on YouTube. However, video report extends beyond this channel, so it includes also any other website where video is its primary reporting mechanism, rather than written articles of photographs. Video reports are growing in popularity. They are easy to share so you can target large audience. Making video report also implies writing. Yes, you will need to plan the script: the introduction, the body and the conclusion. So, spend some time thinking about the themes and points that you intend to cover in your video report. Write them down in order to be sure that nothing is skipped once the camera starts rolling. Practice makes perfect. If you want to present the topic in the video report, it won’t hurt to practice in front of a mirror. That way, you will get used to speaking clearly and without anxiety in front of camera. Diversify content. Instead of showing your face and talking incessantly about the winery and its wines, diversify the content of your video report. During the winery tour, create recordings of the cellar, interior and exterior of the winery, shoot some extracts from the tastings you had… Then, combine all these with your monologues. This way, the video report will be more interesting to watch. PHOTO STORY – a group of pictures that are supposed to tell a story to someone. Often include introduction and captions (some photographers strongly object to it as they believe that a photograph should tell a story clearly without additional explanations). The key photo. Always try to include in your photo story a key photograph that is strong, powerful and expected to impress the viewer. Don’t be afraid of linear narrative. Although you may think that linear narratives are too simple or straightforward, they are quite effective and viewers like them a lot. No matter how experienced or talented you are, there will always be new area for improvement. Find new ideas, adapt to trends, benefit from winery visits. It is vital that you bring emotions and human feel into your stories no matter which reporting mechanism you choose.